Brunch is my favorite meal ever in the whole world. Breakfast potatoes are my favorite brunch item. Add some runny eggs...perfect. I have made a lot of breakfast potatoes, so I'll add that while soaking the potatoes isn't absolutely necessary, the difference between soaked and unsoaked taters is quite noticeable. 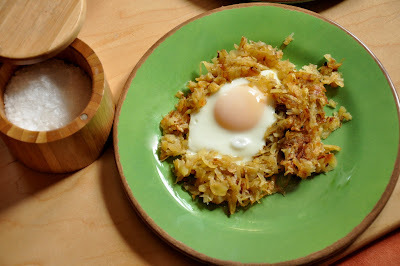 Removing some of the starchy weight will make a lighter, slightly crisper batch of hash browns. I definitely think it's better this. 1. Wash and then grate the potatoes with the skins on. Soak shredded potatoes in a large bowl with cold water for at least 30 minutes. If particularly starchy, drain, rinse, and replace the water. 2. Drain the potatoes well. Meanwhile in an oversized skillet (that has a lid), heat oil and butter. Saute the onions until soft. 3. Add the red pepper flakes, stirring well. Then add the potatoes tossing and toss them with the onions. Add salt, pepper, and cayenne, and mix together. 5. Total cooking time before adding the eggs will be around 35 minutes. When you're satisfied with the texture of the hash browns, make four small holes so that you can see the bottom of the pan. Crack the eggs and gently deposit into the nests. Cover the pan and cook on medium-low heat for about 4-5 minutes, or until the whites are set. 6. Remove the lid, turn off the heat, and let the eggs rest for about 3 minutes. Serve with a strong cup of coffee and a mimosa.